Is there any rule in networking which says that the ping(echo request) reply should come from the same path from which the ping(echo request) has been sent? For example If I ping 192.168.2.1 from R1's se0/0, according to my configuration the ping(echo request) should go from R1->R2->R3'(se0/1) and reply(echo request reply) should come from R3->R4->R1'(se0/0) since I have given static routes on all routers. There is absolutely no rule to the effect that pings follow the same path on return, quite the opposite in fact. 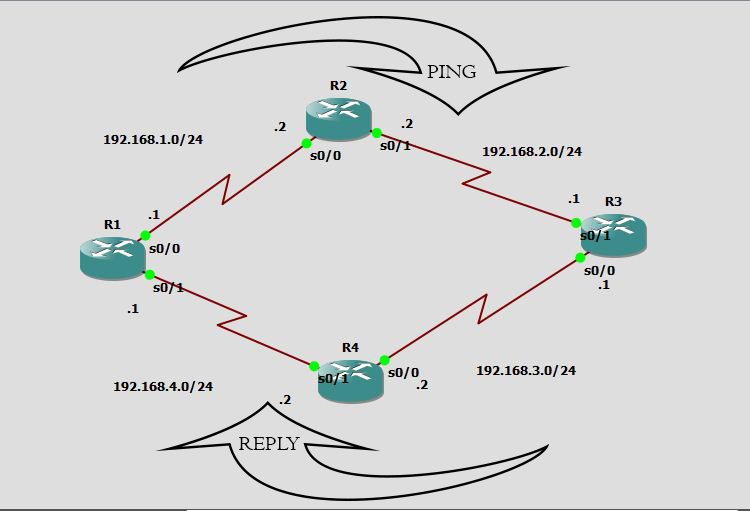 ICMP packets are routed based on their destination, so if you have asymetrical routing somewhere in your network, the ICMP request will take one path, and the reply will take another. This is also why it is often useful when troubleshooting to get traceroutes from both ends of your network. In this case though, are you not missing some routes ? On R1 for instance you have a route towards 192.168.2.2/32, but not towards 2.1. I have tested it locally. the request and reply packets may take different paths. Not the answer you're looking for? Browse other questions tagged routing or ask your own question. Why R1 is not reachable to R3? How is my GRE-Tunneled packet being routed? Multihomed Internet edge without BGP. Overlapping routes, a viable design? Must a broadcast request come from the same network? How to ping a router which has same IP address and mask? Do routers send a reply out the same interface they got a request from? Does reply use the same path from which the ping has been sent?